I promised Moe I would bake cookies today. His favourite cookie is the "Best Oatmeal Cookies". I posted the recipe here a few weeks ago. This time, for something a little different, I added one cup of Callebaut white chocolate (broken up into small chunks). Along with the sugar topping I also sprinkled the top of each cookie with a little Murray River sea salt. TIP: Murray River Sea Salt is similar to Maldon Sea Salt. Both of these salts are flaky and can be crushed with your fingers. Murray Sea salt has a pretty peach colour. 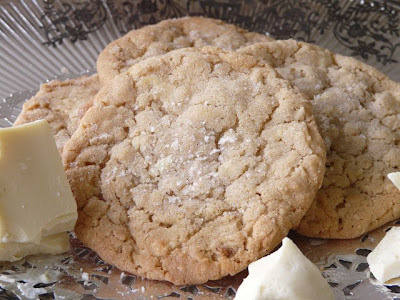 This idea came from Jacques Torres Chocolate Chip cookies sprinkled with sea salt. I really love the combination of sweet and salty. 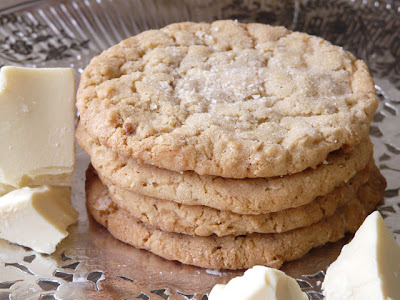 Oatmeal cookies are always a winner with me. I like the idea of the white chocolate being added. 2 favorites! Thanks Ann..I have Maldon..not Murray..don't think I have ever seen it..:) Sounds peachy keen. I love adding sea salt to brownies and cookies. And toss in white chocolate too?? You've got a hit on your hands. Yum, they look scrumptious! Salty, crunchy and sweet? I'm there!